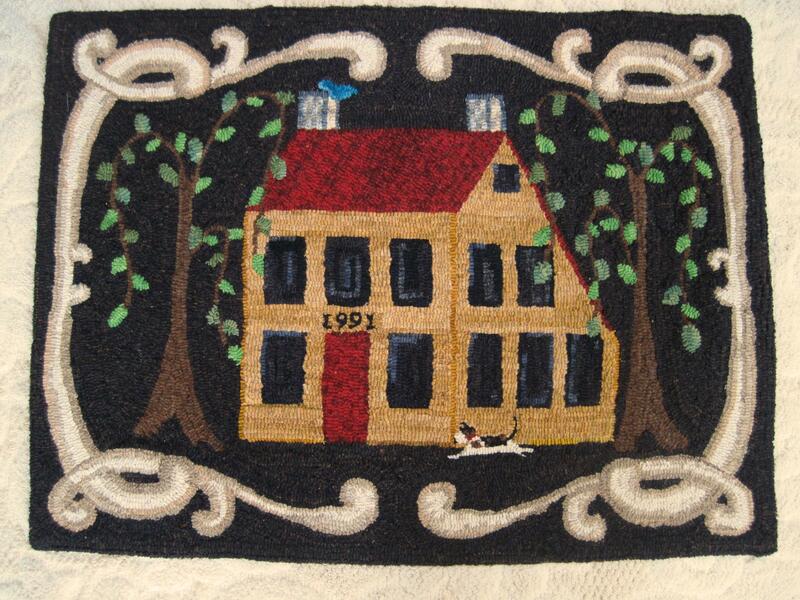 We do custom, one of a kind designs and rugs for our customers. Have a scene in mind that's near and dear to you, or something to commemorate that you'd like in a hooked art piece? Or possibly a throw pillow, table decor, chair pads or something else? Whether you want the piece hooked by us, or a design to hook yourself, we can help. Contact us and we can make your vision a reality. 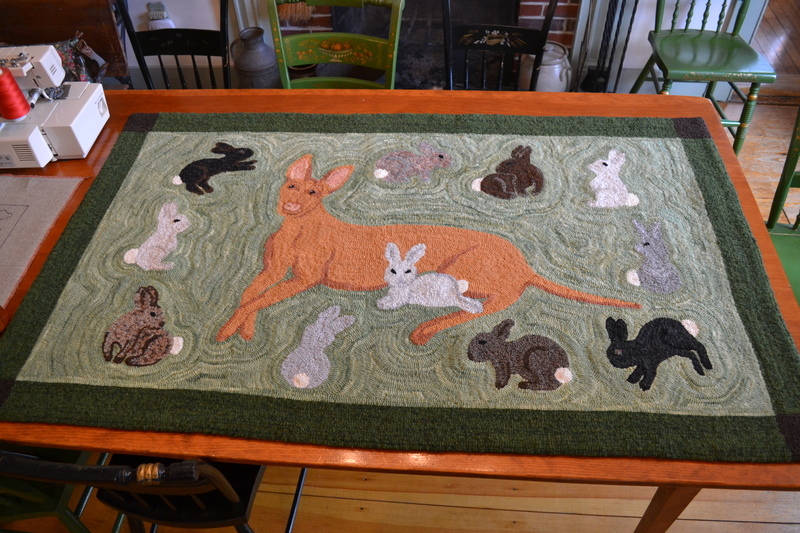 This rug was a collaboration between Beth and our customer, Stephen Sipperly, who was really the visionary for the design. Read its story here. This is the scene at our customer's lake front home on Lake Willoughby, Vermont. Pattern drawn by Daniel Rosenburg, hooked by Beth Miller. Primitive house with scroll work done for a customer, with custom date over the door. Design by Jen and Dan Rosenburg, hooked by Jen Rosenburg. 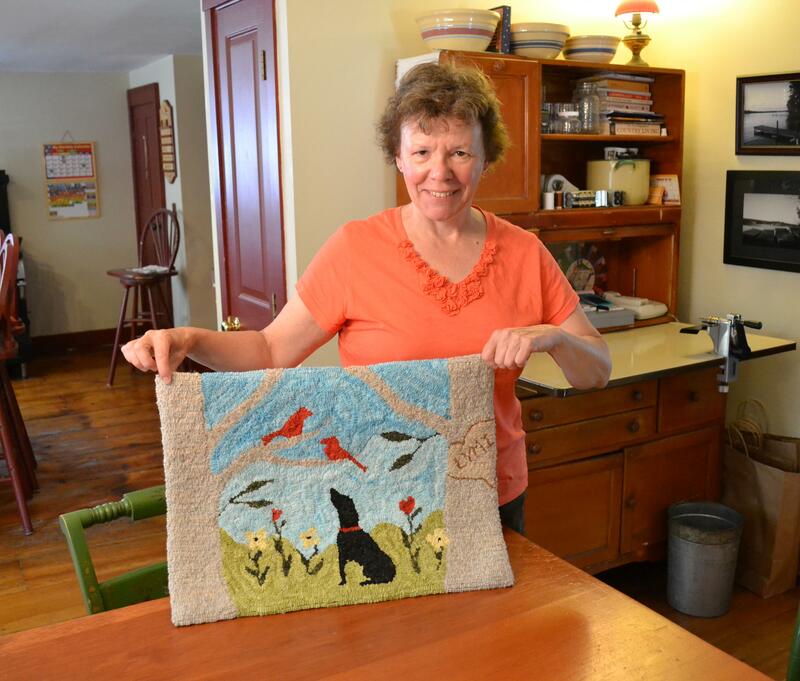 This is Maine studio customer Lois Ruff holding a wedding rug she hooked for relatives. Design adaptation was a collaboration between Lois and Beth. 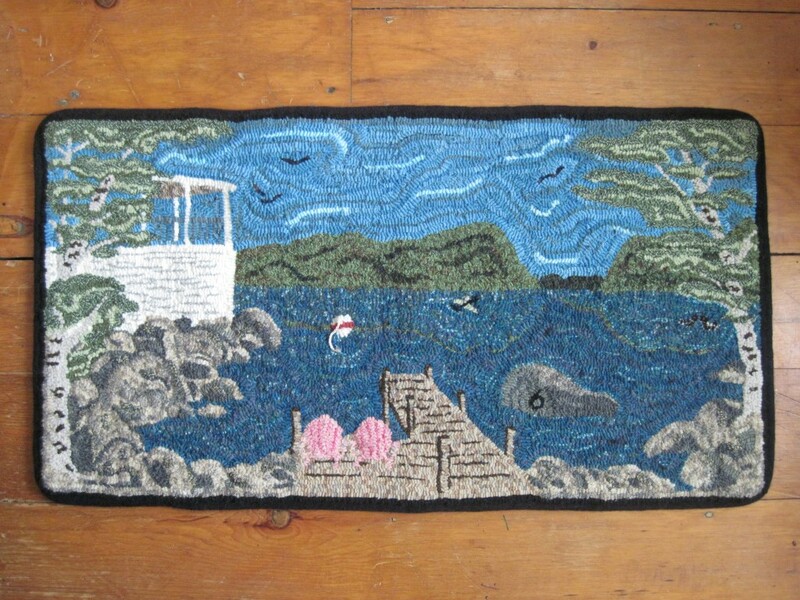 From Lois' imagination through Beth's pencil and Lois' hook, this design idea became a rug. We also adapt and customize our production patterns. 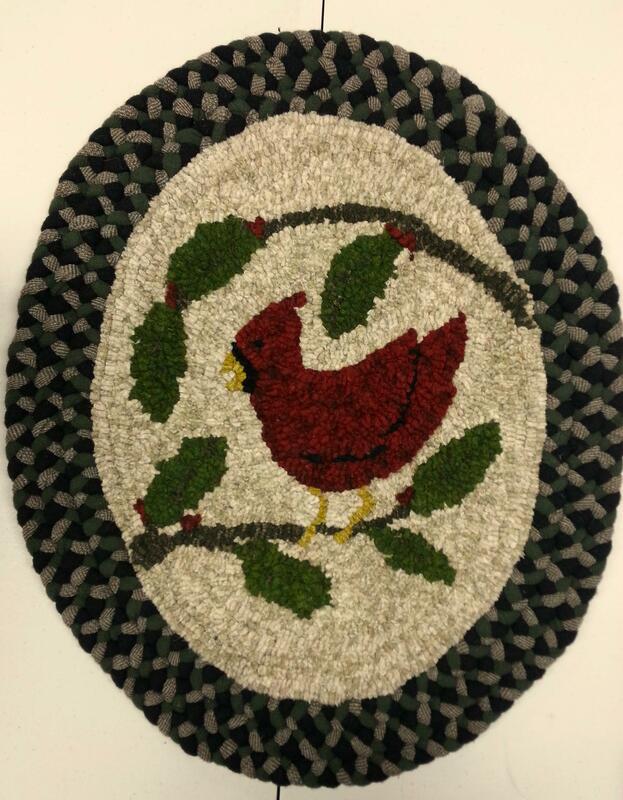 This customer asked if we could make "Emerson's Redbird" an oval appropriate for binding with braiding. We said, "Yes!" Design by Beth Miller, hooking and braiding by Pat Watson. 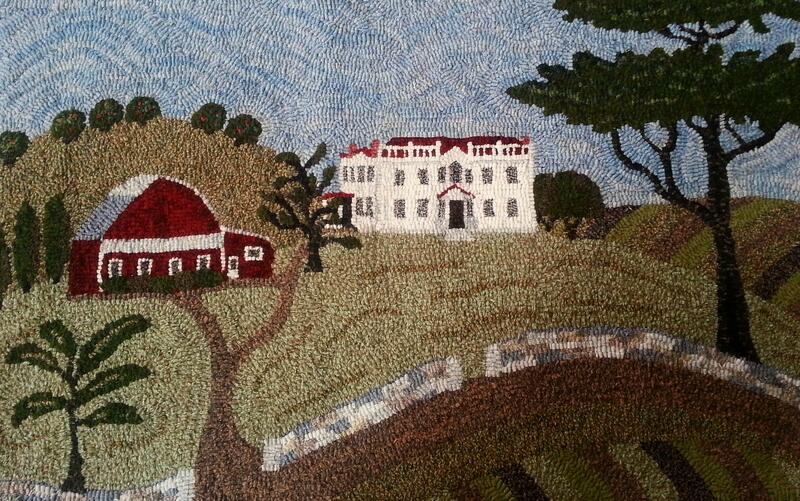 Detail from a rug we made as a gift to Josh Kilmer-Purcell and Brent Ridge of the Beekman Farm, Sharon Springs, NY. Design by Daniel Rosenburg and Beth Miller, hooked by Beth Miller. 1) We love to help customers bring their pattern ideas to life, however, we do have caveats. While it's incredibly rare to be asked to, we will not design patterns that we find objectionable in any way, at our sole discretion. Additionally, sometimes we have pattern requests that we might refer out to another designer or studio we believe would be better suited to complete the specific project. 2) We care very, very much about copyright protection and intellectual property. We will not copy another designer's pattern at the request of a customer. We will, however, assist the customer in getting in touch with the original designer/studio to see if that pattern is available or if they would be willing to do a custom adaptation.